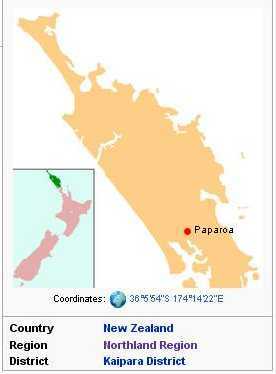 Paparoa is a settlement in Northland, New Zealand. The Paparoa Stream flows from the east, through the settlement, and into the Paparoa Creek to the south, which joins the Arapaoa River which is part of the Kaipara Harbour. State Highway 12 passes through Paparoa. Matakohe is 6 km to the south west, and Maungaturoto is 12 km east. Paparoa was one of several Kaipara settlements established by a religious group known as Albertlanders. Port Albert near Wellsford was the main settlement, and Matakohe was another. They settled at the Paparoa Block in 1863. The land was burnt off so that corn and grass could be planted. A road was constructed to the port at Pahi in 1865, and one to Matakohe shortly afterwards. A pottery using local clay and a factory making rope and matting from flax operated in the 1870s, and brick and tile yards were established, but their business suffered from the poor roads and high freight charges. The nearest stores were in Pahi, 6 miles (9.7 km) to the south. The steamer Minnie Casey connected Paparoa with Helensville on the south side of the Kaipara with a weekly service from 1882, and the S.S.
Ethel took over from 1891-95, after which services went only to Matakohe and Pahi. The network of roads in the area were improved in the 1880s and 1890s. In the 1890s, Paparoa had 35 families and about 200 people, mostly living along the banks of the Paparoa River. Including Pahi, there were 400 people in the area. 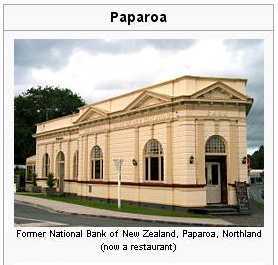 By 1906, the population of Paparoa had doubled. Pastoral farming became established in the area, and a dairy factory was opened in Paparoa in January 1895. 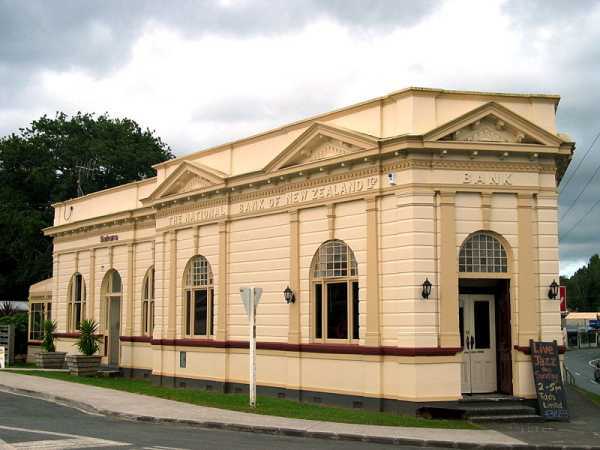 A branch of a Helensville-based department store was operating in the town in the 1900s. The North Auckland railway line reached Huarau, to the east of Paparoa, in the early 1920s. A route through Paparoa was planned at one stage but this did not eventuate. The road to Maungatoroto, which passes through Huarua, was metalled in 1922. * Alex Tait, cricketer, born in Paparoa. * James Wright, potter, worked in Paparoa in the mid 1870s. Paparoa School is a coeducational contributing primary (years 1-6) school with a decile rating of 4 and a roll of 72. The school was established in 1870, and had a roll ranging from 27 to 42 students up to 1899. This page was retrieved and condensed from (http://en.wikipedia.org/wiki/Paparoa) see Wikipedia, the free encyclopedia, January 2009.